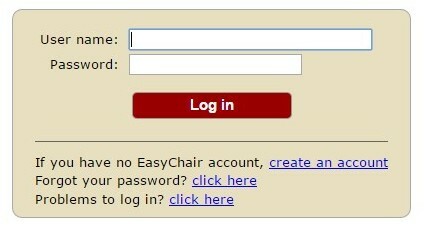 If you have never used EasyChair before you must register a free account. If you already have an account then you may skip these preliminary steps and scroll to Section 2 below. ii) Click “Create an account”. 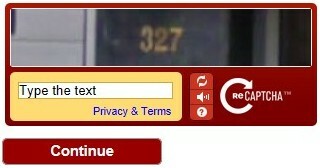 iii) Fill in the Captcha – then click “Continue”. To use EasyChair, one should first create an account. The procedure for creating an account is the following. 1. You should type the text that you see in the image below and click on “Continue”. 2. If you type the text correctly, you will be asked to fill out a simple form with your personal information. 3. After you filled out the form, EasyChair will send you an email with a link that you can use to complete the account creation. Enter the text you see in the box. Doing so helps us to prevent automated programmes from abusing this service. If you cannot read the text, click the reload image next to the text. iv) Fill out your name and email address. Click “Continue”. Note that the most common reason for failing to create an account is an incorrect email address so please type your email address correctly. † Note: leave the first name blank if you do not have one. If you are unsure how to divide your name into the first and last name, read the help article about names. v) You will be sent a confirmation email containing a link to continue your registration. Click the link. vi) Complete your registration by providing all the required information, and picking a username and password. Then click “Create my account”. ii) Sign in using your new or existing username and password. 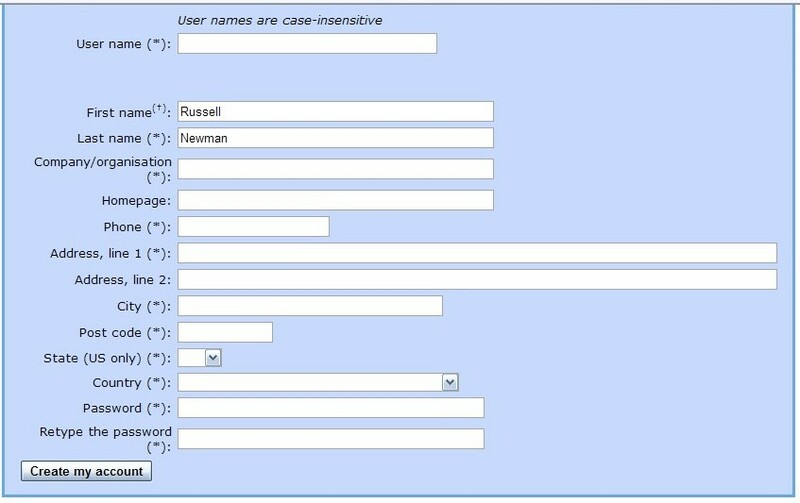 iv) Fill out the forms to provide author names and affiliation. If any of your co-authors have already signed up to EasyChair, you can click “Add an Associate” to search for them. Otherwise you should add their information manually. Note that only the submitter of the abstract is required to have an EasyChair account. Follow the instructions, step by step, and then use the “Submit” button at the bottom of the form. The required fields are marked by (*). Email address will only be used for communication with the authors. It will not appear in public Web pages of this conference. The email address can be omitted for authors who are not corresponding. These authors will also have no access to the submission page. Web site will be included in the conference programme. It can be your own web page (e.g. as an academic or employee), or the website of your research group or department. Each author marked as a corresponding author will receive email messages from the system about this submission. There must be at least one corresponding author. If your co-author does not wish to receive emails about the abstract review, then please do not indicate them as a corresponding author. The title and the abstract should be entered as plain text, they should not contain HTML elements. 30 word limit for the title, 300 word limit for the abstract – you do not have to use all of the words! Type a list of 3-5 keywords (also known as key phrases or key terms), one per line, to help characterise your submission. Please select the parallel session most relevant to your submission. If you wish to present a poster, you only need to select this option, you don’t need to select an additional theme. vi) The form also includes a number of other questions relating to permission to upload your final presentation to the EUSPR websites, presentation format preference (oral; or poster acceptable if not accepted as an oral presentation) and attendance at the Members’ Meeting (EUSPR Members only, delegates are very welcome to join the Society, see the Members page for details). vii) Please DO NOT upload PDFs or Word documents using the Upload Paper Section (if displayed), only use the text form to submit your abstract. viii) Click on the Submit button. Do not press the button twice: uploading may take some time. Once submission is successful you will see basic information about your submission (see the illustrative example below). You can get back to the page with your submission details at any time by clicking on Submission# (where # denotes the number of your submission) in the main menu. If you need to make any changes to your submission (update information, update authors, submit a new version, or withdraw your submission), use the links on the right hand side of the page. Please note: EasyChair sends an automated confirmation after a submission has been received, if you do not receive this email then your submission has not been received. You can also login to your EasyChair account to check the status of your submission.